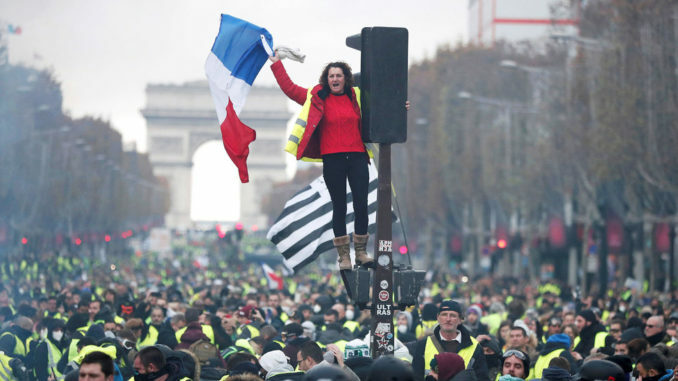 Millions of French citizens have demanded that globalist President Emmanuel Macron resign, as the uprising in France continues to gain traction. According to a new poll conducted by Odoxa and Dentsu Consulting, Macron now only has a tiny 25 percent approval rating. Express.co.uk reports: The poll, which analysed the voting intentions of 1,004 people and has been carried out between January 2 and 3, found that a staggering 75 percent of French voters is unhappy about what Mr Macron and his Government have done so far. These numbers become even more alarming for the Elysee when compared to the results of a similar poll taken in April 2018, when 59 percent of those surveyed were unhappy with Mr Macron. After weeks of violent demonstrations carried out by protesters wearing what has now become an iconic yellow vest, the president promised to implement measures aiming to boost household incomes. Among them, Mr Macron promised to increase the minimum wage by £89.84 (€100) a month and reduce taxes for pensioners in difficult economic conditions. But these promises were not enough for 54 percent of the French polled, who believe the biggest political priority for the country is to find measures to boost purchasing power. Unemployment, which has been the first cause of worries for French people for months, has now slipped to the fourth place. The survey also found that more than half of those polled, 55 percent, believe the yellow vest riots should carry on, despite Mr Macron meeting some of the protesters’ requests. The yellow vest demonstrations are a result of a grassroots movement born on Facebook out of a severe discontent for the stringent economic measures carried out by Mr Macron in the past months. The movement, not affiliated to any political party, erupted on November 17, when hundreds of thousands people took their outrage to the streets and marched against the planned increase in the fuel tax. Despite the Elysee caving in and scrapping the rise, thousands of people keep marching every week to manifest their unhappiness towards Mr Macron’s Government. However, the movement has been dealt a hard blow when its figurehead Eric Drouet was arrested on Wednesday. Mr Drouet is under investigation of allegedly organising a demonstration without seeking official permission. The offence could cost him up to six months in prison and a £6,760 fine. Mr Macron is also facing turmoil within his team, with his main speechwriter and top media advisor Sylvain Fort announcing yesterday he is leaving his post at the end of the month. This resignation comes after Mr Macron’s senior security advisor had to be fired after being filmed roughing up protesters during a demonstration in July.